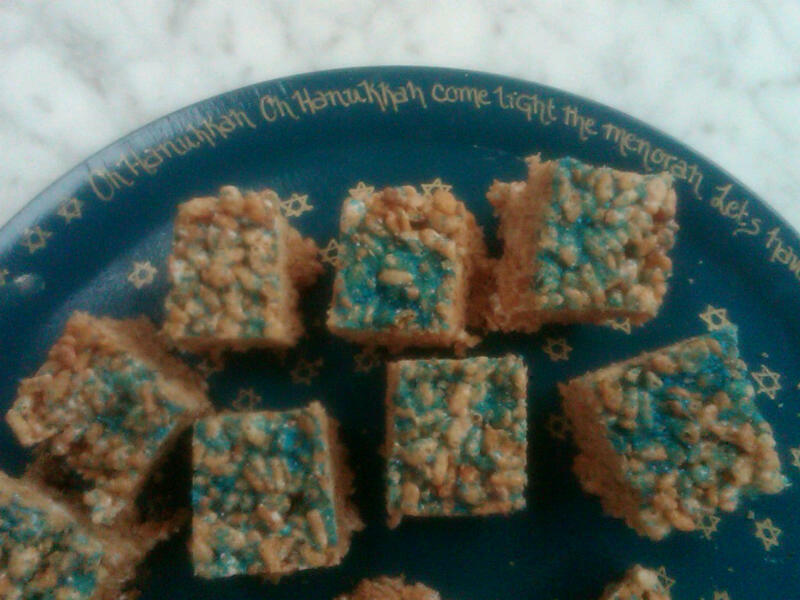 Time For Hanukkah Treats! Decorate with abandon! Stave off mid winter blues with Empty Carbs! Time for Fun and Family, Friends, and FOOD! Under the influence of GG and Grandpa we learned, decadently, to love eating masses of them with creme fraiche and gravlax and caviar. 1/2 cup flour or cup-for-cup gluten free "flour"
Using the shredding blade of a food processor, shred the potatoes. Set colander lined with a dish cloth in the sink to drain. Place the potatoes in the cloth lined colander, and squeeze out all the liquid you can. Grate or finely chop onion, mix in eggs, salt and pepper. Continue squeezing out as much liquid as you can, put half the shredded potatoes in with the onions and eggs, and return the other half to the food processor with the steel blade, and pulse a few times. Mix the chopped potatoes in with the rest, add flour, and mix well. You cannot really make this mixture too far in advance, as you probably know, the potato mixture will darken. However, if you cover it tightly with plastic (right on the surface of the potatoes), and cover with a dish towel, you can get about 45 minutes grace time, before the mixture turns unappealingly gray. Heat about 2 1/2 inches of wesson oil in a large frying pan, and heat the oil till smoking. Drop a bit of the mixture in, it should sizzle like crazy. Using a deep-fry thermometer will give you the best idea of the temperature of the oil--- aim for 350 degrees for best results. Add tablespoons of the mixture into the pan, allowing the oil to come back to temperature. Turn occasionally with a slotted spoon, and cook until they are nut-brown. Drain on brown paper bags over a rack, and sprinkle liberally with Kosher Salt. Keep latkes warm until the batch is done on baking pans, lined with paper towels in a 225 degree oven. Serve with Creme Fraiche, Applesauce, and Gravlax (make your own with this recipe). 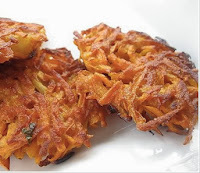 One of the blogs that I avidly follow is called Smitten Kitchen, and I remembered seeing a recipe for these there. I have adapted it substituting Vegan Marshmallows, and Brown Rice breakfast cereal, but I invite you to try it. If you have blue sanding sugar and want to decorate with it, shake it on top of the pan while the "treats" are still warm. Butter (or coat with non-stick spray) an 8-inch square "brownie pan"